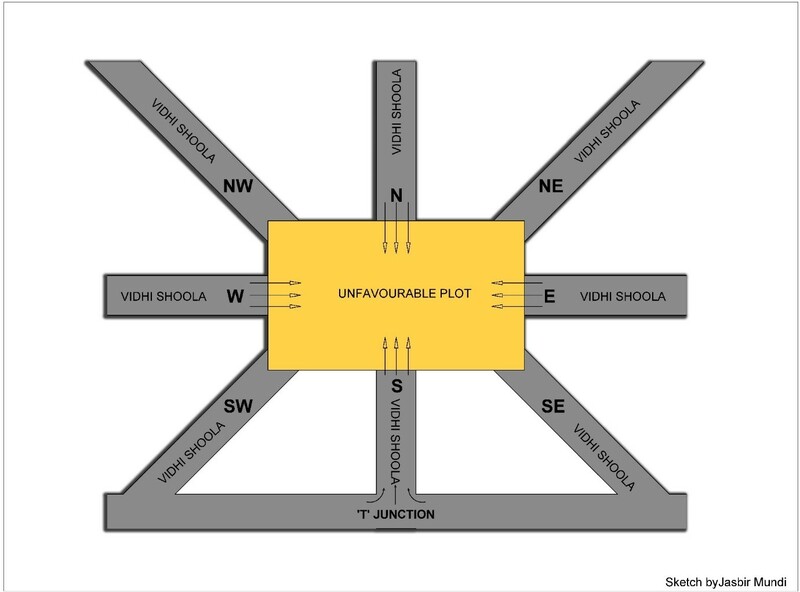 Vidhi (Road) Shoolas (Arrows); when there is a road or a lane running right into the face of site from any directions it is called Vidhi-Shula. In other words Vidhi-Shula is a road hitting or a spearing street. (a) When the plot and road are in line (a dead end in front of entry gate). T junction road hitting is broad from front and narrow from back. Dead end or T junction road is very- very bad in whichever direction it comes from. Harassments like pain, disease are occurred due to such roads. If it comes from Sink direction it is not good, but if it comes from Source zone then it is bad but momentary. Vidhi-shula from South-west direction it is worst, (Sarvnash). So leave that place immediately. Some other names of Vidhi-shula are Therukuthu / VeedhiShula VedhiShool / VedhShool / Vithishoola. Very good, prestigious and causes prosperity. Financial loss, breach of trust, cheating, theft, fire. Causes ill effects for the life of house owner, accident, illness, financial loss, sudden death, suicide. Financial loss, bad effect for the woman of the house. Enemy, court cases, restlessness, suicidal tendencies, financial loss, interruption in work, bad habits, disturbances in life. Financial gain, improvement in intellectual faculties. Some of the Vidhi-shula are good but mostly they are negative and can be treated with remedies.